If you recently fitted a split-charging system to your 4×4, but you’re unhappy with the results (recharge rate), your auxiliary battery may be to blame. National Luna tells us more. The subject of auxiliary-battery selection can be a minefield of data, facts, and uninformed opinions. This situation is made worse by the retail sector, in which well-meaning salesmen (with limited knowledge and battery training) make the mistake of recommending their top-selling battery as a one-size-fits-all solution. More often than not, this is a deep-cycle, wet-cell/flooded battery. Another problem with the battery market is that there is little (if any) information on how various batteries perform under different charging conditions. Unfortunately, most battery manufactures don’t want this information publicised, as it might reveal too much about their product’s performance. National Luna recently invested over R250 k in a vast range of battery-testing technology. The information we gather from these tests will give us a better understanding of how various batteries perform in specific dual-battery systems and/or applications. So far, the tests have revealed extraordinary data, but at the crux of it, we’ve reaffirmed a message we’ve known for more than 20 years: Your auxiliary battery is the heart and soul of your dual battery system. Ironically, battery selection is often the area that most people merely glance at before focusing their attention on the dual-battery system itself, believing that an expensive isolator and/or DC-to-DC charger will solve all their problems. The truth is that more than 80 % of all dual-battery problems have nothing to do with the split-charging system, and almost everything to do with the type of battery you’ve selected. 24 hours to reach a 100 % recharged state even under optimum charging conditions. This is obviously not ideal for most overland travelers who drive far less than that on an average day. Other factors, such as the alternator’s output, will also have a significant impact on the battery’s recharge rate. This is why we sometimes recommend the use of a high-cycle battery instead of a deep cycle unit. Sure, the high-cycle battery won’t last as long, or offer as much usable energy; but it will recharge considerably faster than a deep cycle version, and therefore, it’s often a more practical solution. However, we’re not suggesting that a high-cycle battery is the final answer for dual-battery systems. We’re simply saying that (in some instances) it may be a better option. Which split-charging system you are using. 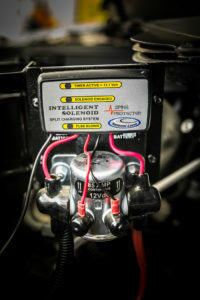 Your vehicle’s alternator output, or operating voltage, is critical (most batteries will not charge with low voltage). Your typical driving time. What your daily power-consumption needs are and whether or not you have a solar system installed. What battery design/technology best suits my needs? This raises the subject of specialist batteries, which are slowly migrating into the 4×4 recreational industry. The following information highlights the pros and cons of three auxiliary battery options that are readily available to the overland travel market. heat causes evaporation and a loss of water, so regular servicing and maintenance is required. What’s more, flooded lead-acid batteries are considered hazardous technology, due to offgassing and the potential of spilling. Although they’re widely available, and their initial cost is comparatively low, flooded lead-acid batteries require maintenance when it comes to inspection, servicing and storage. What’s more, because a flooded battery will typically discharge up to 10 % per month, it’s vitally important that this battery type be connected to a maintenance charger when not in use. This is a sealed (valve-regulated) lead-acid battery that is not subject to spilling, and is maintenance-free. Gel batteries generally have thinner plates, and the electrolyte mixture features an additive that creates an almost gellike consistency. The drawback of gel batteries is that they require precise charging, a slower charging rate (voltage and time), and that they are easily damaged when overcharged. An even more crucial point is the fact that gel batteries are extremely sensitive to heat, and should never be mounted in a location where they’re exposed to an ambient temperature exceeding 25° C. This includes engine-bay applications, or even in the back of a hot SUV parked under the African sun. Also a sealed (valve-regulated) lead-acid battery that’s maintenance-free. However, the big difference between an AGM battery and a gel battery is that the electrolyte mixture is not a gel substance. Instead, the AGM uses matted glassfibre separators in which the electrolyte mixture is trapped. In most cases, an AGM battery will recharge faster than a flooded battery; but, because of the thinner plates, the AGM won’t handle a discharge rate greater than 50 %. Users may have to replace the battery more often because of their potentially shorter life span. This battery boasts the thickest plates of the four units listed here; it also has the higher density of active materials, which results in better performance, greater capacity, and a longer lifespan. Dry-cell batteries are also completely sealed and maintenance-free, and they recharge quickly. The downside is that most dry-cell batteries are expensive; but, when you consider their performance and total working life, they can offer good value for money in the long run. Next Next post: Watter Battery Is Die Beste?